After a spectactular regeneration inside his TARDIS, the Twelfth Doctor regenerated into a brand new body. The Thirteenth Doctor is the woman who, quite literally, fell to Earth! Being joined in her adventures in space and time by her new friends Graham, Yasmin and Ryan, the Doctor is ready to face a whole galaxy of adventures. It's going to be brilliant! 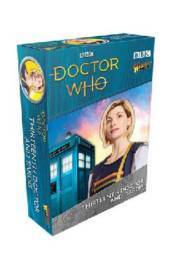 This special set features models of the Thirteenth Doctor, als played by Jodie Whittaker, and her brand new TARDIS.